Thanks to Claudia’s prodding, I am finally getting around to reviewing this! I really should have reviewed it ages ago, but I didn’t. But now I am! Better late than never. This is a collection of 4 short films, made in honor of the 100th anniversary of Indian/Hindi film (the first Indian film was in Hindi. This feels like something for the anniversary of Hindi film, so we will say that’s what it is). Since it has the 4 short films structure, that makes it a wee bit hard to review. What I am going to do is a general No Spoilers discussion of each film in turn, and then move on to a general SPOILERS discussion of each film in turn. I love this movie. I think it is well-made and thoughtful and deeply felt. And also really really beautiful in a way that is completely different from Karan Johar’s usual style. Even things like the apartment style. This movie is set in the usual wealthy upperclass crowd that Karan likes. But instead of the “filmi” version of their apartments with bit sweeping rooms and enormous framed photos and fountains and so on, we have a real looking version. Clean and modern with big windows, but only 3 rooms and mass-made furniture, no angelic devoted servant in the background, no bright colors, it’s all much more like you would expect for this couple in real life. In the same way, there is the way he changed Rani Mukherjee’s look. She is meant to be a mature woman, dressing a bit flirtily but still classy. Her sari blouses fit perfectly and her make-up is exact. But she doesn’t have perfectly windblown hair in every scene, she isn’t introduced in slow motion, she isn’t wearing chiffon saris to work or mini-mini-skirts. Karan’s two most distinctive elements, the sets and the clothes, are altered totally for this film. And of course the plot is also altered. Without getting into SPOILERS, I can point out that instead of revolving around big family drama, it is about young people on their own in the city. Well, “young” people. Karan has mature characters in this film who actually feel like mature characters. It’s not the Kuch Kuch Hota Hai version where they are in their late twenties and barely different from college. These are people who carry the weight of their age on their shoulders. And, conversely, the young character carries with him the lightness and impulsiveness and fearlessness of youth. Most of all, it has an open ending. Karan always struggles with his endings. His films end. And then end again. And again. And again. But in the short film structure, he let himself have an open ending, no need to search for that perfect resolution. And it is beautiful, it gives us all the resolution we need. I avoided watching this film for a long time because, based on the stills and bits I had seen, I thought it might be the most emotionally affecting for me. But it really wasn’t. I think partly because it is about an artist journey, while the two films that affected me the most (Zoya’s and Karan’s) are more of a journey of personal trauma. And partly because it is so male focused. Karan and Zoya’s short films, like all their films, blend male and female equally (okay, all of Karan’s films but ADHM and all of Zoya’s films but ZNMD). But Dibaker’s film is strictly focused on his main character, Nawazuddin Siddiqui, who is in the very particular situation of a male householder. This isn’t necessarily a flaw of the film, it’s just a risk you run when you make something so strictly based on one perspective, that not all of your audience will relate as strongly. Dibaker is using an artist, who is also the male head of a hosuehold. So that’s going to get him a very large percentage of the audience right there, anyone who has dealt with male responsibilities and issues, and anyone who has struggled with artistic fulfillment. And he couldn’t make the kind of film he wanted to make, something that has internal dialogues and all that, without focusing on a particular perspective. So that’s okay, that’s what the short film format is for, to experiment with things like this. This is also the only one of the films to directly deal with filmmaking. One thing that strikes me on this watch is how much this series is truly “Bombay” talkies. It is about the experience of Hindi movies as it is lived by the residents of Bombay, whether they are fans or stars or workers. 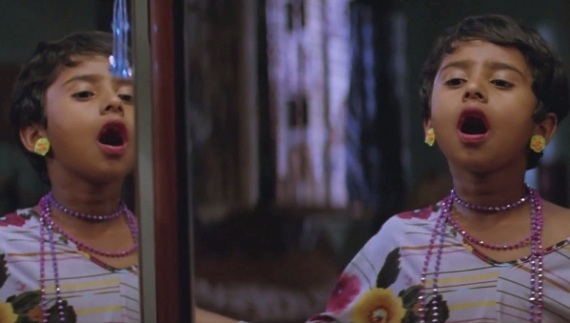 And this is the film that shows how filming itself is experienced by Bombay residents. Their reality, and then the touch of magic they experience thanks to their closeness with stardom, what keeps them going through their tired Bombay lives. My second favorite of the films! It isn’t such a stretch for Zoya, this sort of slice of life open ended character piece is very similar to Luck By Chance and Honeymoon Travels Pvt. Lmtd. She is in a slightly different world, setting her film in an average middle-class household. Now that I think about it, the four films work together to show us every layer of Bombay society, Karan giving the upper class, Dibaker the lower, Zoya the middle, and Anurag the pavement dwellers. Zoya taking the middle instead of the upper is a bit of a reach for her. But otherwise, this is nothing terrible different from her other films. Once again, she is focused on a small group of characters who interact and grow through their interactions. And she is dealing with gender issues. Gender issues in the broad sense are always present in her films, Zoya is fully aware of the difference between the life of a son versus a daughter, or an aspiring actor versus an aspiring actress, or a husband versus a wife. And they are present here as well, father and son versus father and daughter, brother and sister and their own particular challenges, in some ways this is almost a prequel to Dil Dhadakne Do. Zoya is never afraid of the open ending, she thrives on the open ending. And in this short film she goes extra extra open. Maybe too open? Or maybe not. She chooses to end on a moment of triumph which resolves nothing. But maybe that was on purpose? All of life is just a series of moments, there is no true resolution, the best you can give is a moment that makes everything seem easy, seem solved. This is the longest film and, for me, the limpest. It just goes on and on. The spark that it starts with slowly gets warn away as it goes on. There is a nice little tidy resolution at the end, this is the easiest film to describe as a short story. Maybe that is the problem? It feels like it was written as a story more than as a film. Funny, since of course Dibaker’s film is the one that actually WAS written as a story first. But this movie, instead of feeling like it lives on images and moments, feels like it is fully plot driven. And that just doesn’t work well for a short film. Instead of feeling like a perfect complete moment in time, it ends up feeling overstuffed and struggling to finish itself. The pity is, there are still some really beautiful images in the film. But they don’t get enough time to breath. Compared with Karan, for instance, who slows it way way down at the end to let us fully feel the emotions that the images he is showing us are trying to convey. The film opens with an angry confrontation between Saqib Saleem and his father, in which Saqib declares he is gay and there is nothing wrong with that, filling in that for most of his life his father has been abusing and torturing him over his sexuality and now he is standing up to him and leaving. We go from there to the peace of Rani and Randeep Hooda’s married life. They get up, they go to their jobs, life is peaceful. Rani works at a magazine where she is supervising Saqib, the new intern. Saqib goes home with Rani and meets Randeep Hooda, and they bond over old film songs. Rani begins to confess her marriage ups and downs to Saqib, who is jealous. Saqib goes to see Randeep at work and embarrasses him, Randeep tracks Saqib down in his little one room rental and confronts him and then kisses him. Saqib tells Rani, she is heartbroken, goes home and confronts Randeep. At the end of the film, they are all alone. Saqib in his room, Rani getting dressed in red lipstick at home, and Randeep alone with the little girl, listening to her sing. What I love about this film is that Karan figured out his characters so clearly. Saqib is angry and confrontational at the start of the film, and it is simmering under the surface for the rest of the film. He is young, gay, and angry. At work he is quick to announce his sexuality, Rani lowkey calls him out on it, he is so clearly itching for a fight (no matter how lightly he speaks of it). He truly feels a bond with Randeep and vice-versa, but he goes about persuing it brazenly, fearlessly, like deep down he is torn between starting a relationship with Randeep and starting a fight with him for trying to hide what he is. His resolution is to be alone, still fighting the world, still growing up, and beginning to realize that he has driven away those who could be his allies. Randeep is the simplest character to understand. Deeply repressed, Saqib brought to his life a moment of brightness that probably even Saqib did not see the meaning of. In the end, he is finally coming to terms with what he has also lost, the forgiveness and love from anyone in his life, by trying to protect himself he hurt everyone else. It’s Rani that I love the most. Because she is not the character that usually gets this much thought and care in this kind of a film. She is good at her job and likes her job. She likes to dress pretty and to flirt a little bit at work. But deep down, she is lonely. She bonds with Saqib quickly because he is someone who will joke with her and be honest with her and she doesn’t have anyone like that in her life. Without consciously knowing it, she has embidded the same deepseated secrecy that Randeep practices, she would never say outloud “there is something wrong with my marriage” but she knows there is in a way that has taught her to keep most people at a distance. But Saqib has his own secrets and shame and loneliness, he is safe, he is someone she can bring in. At the end of the film, the betrayal of Randeep hurts but is cleansing. We see at the end that she is free to reclaim her sexuality, put on the revealing clothes she teased towards, and the bright red lipstick. But it is the betrayal of Saqib that hurts more, and for Saqib, I think, it is the loss of Rani as a friend and ally that will be most painful in the long run. Really, it is not the usual “love triangle with a gay husband” kind of plot! Nawazuddin Siddiqui is a husband and father to a little girl who lives in a little apartment with shared water and bath in a building by the train tracks. He tried to start an Emu business and failed, his Emu still wanders around the apartment. His wife brings in the regular salary, and pushes him to apply for a job as a watchman. He is late for the interview and loses the job. On the way home, he stops to watch a filming and is pulled from the crowd to play a character who walks across the sidewalk and bumps into the hero. He has a few minutes to prepare and is shocked to discover just how small his role will be. He imagines a conversation with his mentor, which is when we (the audience) learn that he is an actor, he traveled with a troupe for some time before moving to Bombay. He complains that he didn’t get his chances as an actor, but his mentor argues that he didn’t want it enough, he wasn’t willing to give up his safety net and fully commit. With this in his mind, Nawazuddin goes and does his bit perfectly, even adds to the character. And then he runs away without being paid, the art was payment in itself. He rushes home to tell the story to his daughter and wife, and they joy the family gains, and sense of worth, is what matters. I’m torn about the ending to this film. I can follow the reasoning of the character’s journey. He is failing his way through life and it doesn’t bother him, except that his daughter has lost interest in his stories. He loses a job by showing up late for the interview, but he didn’t really want the job anyway. He has to help with the housework while his wife works, and that doesn’t bother him either. What comes to him in the moment of doing the film role is caring about something, doing his best, instead of just deciding not to let it bother him. And that’s why he has to run away without payment. If he does it for money, it lessons the personal achievement. It has to be something just for himself, to prove he can do something well just to do it well. But isn’t that also kind of not trying? If he had stayed, he could have been paid for acting, and given his contact information to the assistant director asking for it, actually worked at something he cared about. I understand the triumph of art for art’s sake, but what about the triumph of art for the sake of more art? Making a leap into the unknown and counting on something catching you? There’s also, potentially, a bit of a class blindness. The money that Nawazuddin would have gotten could have really helped out his family. His dramatic gesture is going to lead to more suffering. But I can also see the other side. Nawazuddin gained the dignity of turning down the money, and it would have been a pointless gesture if it hadn’t caused him pain. Doing this one thing for the sake of true art regained him his dignity and fire, that could turn into being more useful for his longterm artistry than any phone number given to his assistant. I suppose in that way this film did a good job. We can debate and debate the meaning of the ending and if Nawazuddin made the right choice. A little boy wants to dance, but his father Ranvir Shorey wants him to play soccer and be boyish. At the same time, his sister dreams of being a pilot and flying away. But her father doesn’t encourage her dreams, will find the money for soccer lessons for his son but not for a school trip for his daughter. The little boy is caught wearing his mother’s make-up and yelled at and punished. But he finds comfort in a TV interview with Katrina Kaif where she talks about following her dreams, and he has a vision of her coming from the TV and blessing him. He is inspired and the next time his parents leave him and his sister alone for the day, he decides to put on a show. They invite all the kids of the neighborhood and collect ticket money so his sister can go on her field trip, and he dances for them to “Sheila Ki Jiwani” as they applaud and the film ends. This is the average middle-class family story. And Zoya knows who she cares about, while the father and mother are mysterious and unknown to the audience, as they are to their kids, the little girl and boy are clear. My favorite part about the film is that they are allies, their father seeks to divide them and it just drives them closer in shared adversity. The little boy is forced to take soccer lessons he doesn’t want. The little girl isn’t given anything she wants because the little boy gets it all. Is it worse to be ignored, or to be tortured? The kids don’t fight about that, they just understand they are both unhappy with their lives. Now that I think about it, there are a fair number of Hindi films which seem to get that, from Dil Dhadakne Do to Dear Zindagi. The gender preference in parenting harms everyone. And then there is the ending. As I said, it’s open ended. We meet this little boy who is just beginning to explore his identity. Is he gay, or transgender, or transvestite? Unclear. Is it that he just really loves to dress up and dance? Possible! What is clear is that his father is not going to have patience with this exploration. And that his exploration is not over, this is not just going to be a brief impulse that can be beaten out of him. I have to think it was Zoya’s choice to end so openly. She could have shown his mother throwing his father out (her expression in a few moments implies she does not agree with his parenting). She could have shown him giving in to his father and learning to pretend to be a “real” boy. But instead she ended with it all unresolved. He has this one great triumph, but his parents are going to return, they are going to find out, his life is going to get a lot worse before it gets better. But ending like this, it does two things. First, it forces the audience to live in the same uncertainty as this little boy and the people who love him. Will he survive or will he die? Will he find people to accept him, will his family accept him? We don’t know. And second, it gives him that moment of triumph, says that this moment matters. Yes his life will be hard, and has already been hard. But it is worth it for these moments of joy, better to have this than to live in misery. It’s what all these movies are about, how film can bring us those moments of pure joy if we open ourselves up to it, and those moments matter. Vineet Kumar Singh is a tour guide hustler in Allahabad. His father Sudhir Panday is dying and asks him to take a Murabba (a candied fruit) to Bombay and have Amitabh Bachchan eat it. Sudhir’s father had sent him on the same journey with a jar of honey looking for Dilip Kumar to lick his finger and dip it in the honey, and the honey had saved his life. Vineet goes to Bombay and tries to force his way into Amitabh’s house with confidence, but is turned away. He stays on the pavement outside, works for food, struggles, and finally begs from the guards and gets their pity. They take his Murabba and have it sent to a lab and make him wait and finally give it to him saying Amitabh bit it. Vineet doesn’t believe them, and Amitabh calls him in so he can watch Amitabh eat it and believe him. Vineet happily gets on the train home and brags about his adventures, a sleeping listener is irritated by his bragging and brakes the jar. Vineet decides to get another fake Murabba and jar and takes it back to his father. He sees through the fake and confesses that he faked the jar of honey as well, Dilip refused to dip his finger and eat, so Sudhir did it instead. There are a lot of themes in this film, way too many for a short film. For instance, there is the way Vineet comes from a religious town and works bringing in pilgrims, and the way he himself becomes a pilgrim struggling with the locals in Bombay. There’s is Vineet’s own journey, from the cocky out of towner trying to force his way in, to the humbled desperate soul willing to beg for help. There’s the twist ending, showing the way that fame only matters if the fans believe it matters, the honey and now the murabba have power because they are believed to have power. And there’s the glimpse of life around Amitabh’s house. The guards who spend their days turning away fans and take their duty seriously. The ebb and flow of fans, the ones who travel far and settle outside, and the ones who show up for a rally and then go away. And the glimpse of life inside from the outside, that Amitabh is willing to eat something a desperate fan brings him, but it has to go to a lab first. That he hears the fan talking and calls him in. Even the way the outsider sees but does not understand, at the end Vineet talks about how Amitabh made his guards hold his bag, but in the moment it was clear the guards were taking the bag to make sure he couldn’t pull out a weapon. Vineet isn’t capable of fully understanding Amitabh’s life, and Amitabh can’t fully understand his (this desperate quest for a Murabba bite), but at least they can each make an attempt. The problem is, while each of the themes is done well, none of them really gets a chance to breath. Or, not quite that, it feels like the film itself never really commits to any of them. There is always a bit of a distance from what is shown. Right up to the end, Vineet losing the jar when it breaks is treated more for comedy than tragedy, the way the camera keeps a distance and surprises us with what happens. After the sincerity of the previous short films, Anurag’s film feels even more out of touch. I also thought that last one was really boring, which made me even more surprised when I realized it was Vineet Kumar Singh when I looked up his wiki page. The one that has stayed with the most is Karan’s. And I think this was the first film where I saw Nawaz and then Lunch Box shortly after. Two similar and memorable performances. I also thought this one held together as an anthology much better because of the Bollywood theme/thread. Lust Stories was much broader in its theme. They are two very different themes in substance, aren’t they? The film theme was more kind of a flavoring scattered over the stories, how movies can be an escape from our problems, whatever they are. But the “lust” them gave the central issue of every story right there, they all had to be kind of the same in terms of content. If they do this again, I wonder what they would pick? Something like “Food” that can be folded into any storyline, or something like “anger” that would define the story? Oh good, it’s not just me that really remembers the Karan one! He really got the short film genre, I think, made a story that could only be told as a short film with the sort of sketching in of character background and no real conclusion. I didn’t like his Lust Stories film nearly as much, but it was a good short film too, with a nice ending that gave us just enough of an opening for us to fill in the rest. Anurag did far better with his Lust Stories film, I think, really tried something different structurally to take advantage instead of making something that felt like a whole movie just kind of condensed. I have rewatched the Karan one a few times, because I love Rani and because it is so well done. All the performances are so good. Thanks for pointing out all the departures from Karan’s usual style, look, pacing, etc. Gives me new things to think about and a reason to watch again. The Nawaz one was tough for me as a parent and breadwinner. I liked it, but doubt I’ll rewatch it again. I liked the Zoya one, and I don’t remember the Anurag one. Maybe I fell asleep on it? I think Bombay Talkies was kind of his practice run for ADHM. He brought in a few more KJo touches in ADHM, but he kept the different kind of filming style and world building, and even the open kind of ending. I would think the Zoya one would be harder as a parent. But then, their parents had control, right? The kids were sad, but it was all problems that were things parenting could fix. Just, get them away from sucky Ranvir Shorey. After this and A Death in the Gunj, I think Ranvir has a real speciality in toxic masculinity in an unexpected package!